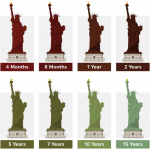 Home » News » Do Metal Roofs Change Colour Over Time? 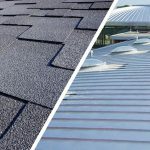 The popularity of metal roofing is definitely on the rise, with many business owners opting for its durability, longevity and non-disruptive installation. 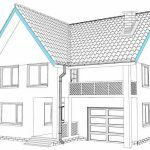 One of the common concerns with metal roofing, however, is how its appearance might change over time. 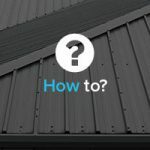 The look of your metal roof is part of its appeal, so it’s helpful to know what changes – if any – you can expect to see regarding its colour over the years. The patina formed on a zinc roof protects it from rust and corrosion – making it one of the most reliable and long-lasting metal roof solutions out there. This patina will turn into a soft, bluish/light grey colour over time. However, some zinc roofs may be susceptible to a chalking, ‘white rust’ effect. As you might have guessed, this is where white chalk-like deposits form, becoming visible on the roof. This discolouration typically occurs due to humidity, moisture and poor ventilation. Properly-installed zinc roofing, where panels are coated and well ventilated, will be able to avoid this. With proper protection from the elements, a steel roof should maintain its colour without much trouble. Over time, it’s possible for the roof to fade, draining its initial colour into a dull and aged alternative. This usually occurs when the painted layer isn’t sufficiently protected from the elements – UV protection, primarily. Rust and corrosion can quickly follow, causing the appearance of the once vibrant steel surface to decay, its colour becoming inconsistent and much harsher. 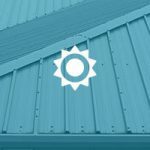 A professionally-installed steel roof will avoid this problem through a reliable protective finish that fights off fading, discolouration and corrosion. The natural patina that forms over time on a lead roof is what gives lead its traditional grey tinge. A lead roof will usually start out as quite a dark shade, but will turn lighter over time due to its exposure to the elements. 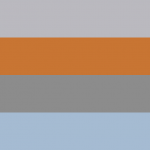 The colour change isn’t too severe; long term colour change varies between differing shades of grey, all of which are in-keeping with the familiar lead aesthetic. Copper roofs have the most extreme colour change over time. Starting out as an rich orange colour, the oxidation process has a strong impact on the copper material. Copper forms a protective patina against corrosion and rust. This patina eventually settles into a green tint, but will pass through many different stages before then. 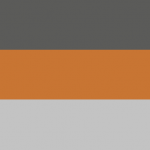 Over the period of many years, copper will go from orange to a dull brown, then transitions into a more yellow/green colour before finally turning fully green. As we’ve looked at in a previous article, one of the most striking examples of this copper colouration is the Statue of Liberty. These colour changes are a natural part of a copper roof’s lifespan, so don’t be surprised when you notice the original orange hue of your roof is slowly maturing into that deep green! JTC Roofing supply and install a range of metal roofing options to commercial, industrial and domestic clients throughout the UK. 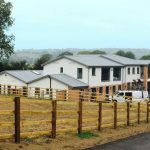 Our experts can advise on the most suitable metal roofing solution for your property, before carrying out an efficient and professional installation to the highest possible standards. For more information on all of our metal roofing materials, contact the JTC Roofing team today.